The Sound Blaster Roar 2 certainly roars loud and proud, even if it's not the prettiest nor longest-lasting Bluetooth speaker on the market. It's not quite king second time around, but equally it's a product not to be underestimated. 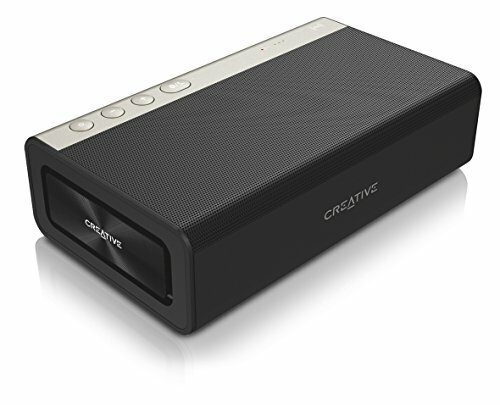 When the original Creative Sound Blaster Roar landed on our desk last year we were impressed by the big sound from its small scale. Now it's the turn of the more compact, more powerful, yet more expensive sequel: the Roar 2. It's incredible how quickly the world of Bluetooth speakers progresses. We've seen some stand-out designs from the likes of Ultimate Ears, while big names such as Sony have excelled with models such as the SRS-X55. Creative, on the other hand, has stuck by its laurels, producing a speaker with exposed ports that lacks the aesthetic elegance of the competition. Is the Sound Blaster Roar 2 let down by its price hike and design discrepancies, or does its sound quality see it roar into a king-of-the-pack position? Buttons, buttons everywhere. There's no hiding from them on the Sound Blaster Roar 2: its fronted by a strip containing on/off, separate volume up/down and Bluetooth/call buttons. But that's just the first four. Up top there's a USB audio/storage switch, Tera Bass on/off button; below which is a section for play/pause, forward/back and shuffle; below which again is a record button with separate play/pause and microphone mute switch. Oh and then the power in, Aux in, DC Out, Micro-USB and microSD ports are all exposed on the rear side (assuming lying the speaker flat on its rubber track feet) which all feels oddly positioned. It all makes the Sound Blaster Roar 2 look like some kind of control station; a miniature portable studio or something. At this point you may also be wondering what's actually new in the second-generation model. Well, the Roar 2 is 20 per cent smaller than the original. But we think if Creative has remoulded the size it should have been, um, more creative and reconsidered the mass of buttons and their placement. Not that the build quality is bad by any means. A metal grille covers the front of the Roar 2, which curves around towards the bottom, and the whole device's shell feels solid. It does weigh 1kg, though, which is the same as carrying around a bag of sugar - and certainly heavier than some of its competitors. To the sides the Roar 2 houses its passive radiators for bass, which have the necessary flex and wobble to allow for low-end to breathe. These are critical to the sound design, as they ensure this little package - which only measures 51 x 188 x 109mm - can really kick out bass-laden sound way beyond what its diminutive size suggests. It's not a reference speaker, but at this scale it more than holds its own and delivers bassier output than the Ultimate Ears Boom 2. Not that it's all bass, of course, with a balanced output of other frequencies throughout an ample volume range whether connected via cable or Bluetooth. That's down to the two tweeters which join the subwoofer driver tucked behind the front grille. The sound isn't as omni-directional as some other products on the market, which seems to be a big growth area for Bluetooth speakers. Positioning is fairly critical too, with better results when raised to earshot, rather than laying on its back as the design seems to want to be positioned. Is the sound of the Roar 2 better than the original model? Despite the size decrease we'd put the two products on par. But the problem with the second-gen product is that it's around £40 more, at £170, without a clear reason for such a price push. That's the same price as the Ultimate Ears UE Boom 2, which is entirely waterproof - a feature the Creative certainly can't offer. With the original Sound Blaster Roar there were some oddities such as the “LS” switch, which activated “life saver mode” to randomly play loud sounds at intermittent moments in time. Not so the Roar 2, which does away with this altogether bonkers idea. But there are plenty of extra features on board, including voice recording to microSD card should you want to use the device like an over-sized Dictaphone. Might have its application for some, but we can't see likely application in the real world. A more interesting quirk is the full size USB port to the rear that can be used to plug in a phone to draw from the on-board battery. Its 5V/1A output is ample to charge a smartphone in a similar way to most battery packs (albeit a little slower than the 5V/2A output we have on a dedicated Lenovo battery pack). A nice touch should you be running low on juice. However, at this scale the Roar 2 doesn't have the biggest battery capacity out there (6,000mAh). It's quoted for 8-hours of use per charge, which seems about right based on our day-to-day desk-based listening. That's a little less than some double-digit competitors, mind, and if you do plug in a phone then it'll be even less. Although to Creative Sound Blaster Roar 2 couldn't be called a reference speaker, for its small size it really kicks out quality audio. There's plenty of bass considering the size, which otherwise typically lacks from such portable Bluetooth speakers. The main drawbacks are the somewhat patchy design, which is bested by bundles of other Bluetooth makers, and a variety of extra features that, ultimately, are of little to no use on a device like this (voice recording, for example). The higher price point of this second-gen device also has little new to offer - we think Creative would have done better to undercut its nearest competition, such as Ultimate Ears, rather than going head-to-head with it with a less attractive looking product proposition. The Sound Blaster certainly roars loud and proud, even if it's not the prettiest nor longest-lasting Bluetooth speaker on the market. The Roar 2 is not quite king this time, but equally it's a product not to be underestimated.